Please plan to arrive by 4pm on the day of check-in. On the first day, you can check in, have dinner and attend the program orientation in the evening. After yoga and breakfast, there will be time for questions, followed by a closing session, to end by 10 am. You can choose a room that suits your needs. We have several options available, which you can select from here: View the Rooms. Retreat room housing is included in the Panchakarma package cost. Should you wish to upgrade, you can choose the spa style accommodation during registration for an additional charge of $356. Both types of rooms are located in the spa building to give you easy access to treatments. I heard it is hilly. How can I get around? During the Panchakarma cleanse, transportation will be arranged to take you back and forth for events in the mountain-top dining hall. For seniors 65 and older, we are offering a special 10% discount. All others who register two weeks before the event starts can get a 15% discount. The program lasts five days and six nights. Participants are asked to check in around 1pm the day before the program starts and to check out after breakfast the day after the program ends. For a complete Panchakarma experience guests are asked to stay for the full five days. Occasionally one of our Ayurvedic doctors may recommend a longer stay. Customized wellness packages are available if our scheduled Panchakarma events don’t work with your schedule, or you may be interested in our “Taste of PK” package. If you register 14 days in advance, the all-inclusive program cost is $2990.00. Within 14 days of the start date, the price is $3,590.00. You can upgrade to a hotel room for $300. What is the difference between a hotel and retreat-style room? Hotel rooms are beautifully decorated with one king bed or two full beds, a tv, and a mini fridge. Retreat rooms offer a simpler experience with two twin beds and a desk. Both hotel and retreat rooms have private bathrooms and a desk, and are not shared unless you come with a friend or loved one. Panchakarma participants also receive useful written materials along with each knowledge session, and essential supplies for Ayurvedic self-care on a daily basis (dinacharya). All taxes, fees, and gratuities are included in the program price. Retail items and pottery classes are available at an additional fee. Guests may also schedule extra spa treatments beyond those included in the program at a 15% discount. The Panchakarma program is totally customized to meet your needs. Meals are personalized for each person’s constitution. Your course of treatments will be refined on a daily basis to address your unique needs as your energy comes back into balance. Guests receive special pre-cleanse and post-Panchakarma guidelines for diet and lifestyle as well as a personalized post-Panchakarma yoga plan. Do we need to do anything before we come? After you register you will be sent a health history form. As soon as you fill it out and return it to the coordinator she can work with the doctor to determine whether a pre-Panchakarma cleanse may be beneficial for you. It is recommended that you get plenty of sleep, stay hydrated, and begin to simplify your diet in advance to ease the transition into an intensive cleanse. What support is provided after the program? Each participant will be trained in a variety of self-care techniques to be continued after the program ends. Participants will receive follow-up emails on a weekly basis for one month, and staff members are available over the phone as needed. We also offer discounted follow-up consultations with the doctor for up to one year after your first meeting. Do you do bastis? Virechana? Yes, we provide several types of bastis and virechana as indicated for each participant. Yes. All of our therapists are trained in Sri Sri Ayurveda treatment methods. An Ayurvedic physician supervises the program, offering ongoing consultations. All of our ingredients, materials, staff training, and program design and preparations are handled with the utmost care. Our caring and professional staff are present 24/7 to address your needs. Who are the people giving the treatments, are they licensed? Where did they train? All of our practitioners are licensed massage therapists in the state of North Carolina. They have hundreds of hours of education and practical experience with human anatomy and physiology. All of our therapists also set an excellent example of personal health and wellness. We provide ongoing Ayurvedic training to all of our therapists and require a great deal of practice after learning each new technique. Ideally everyone would go through a Panchakarma cleanse at the change of each season, but every six months to one year would also be extraordinarily beneficial. However, even doing Panchakarma one time provides a powerful cleanse and a valuable opportunity to experience the effects of Ayurveda. What is the facility like, what are the rooms like? 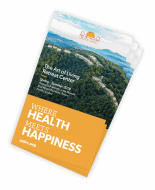 Our wellness center is located in the extraordinary Blue Ridge Mountains in North Carolina. The air is clean and fresh and the views are expansive. Almost all of the Panchakarma treatments and activities take place in our spa building. We do our very best to ensure that participants do not need to go outside except to enjoy the view or go for a pleasant stroll. Our hotel rooms offer king or full-sized beds, TVs and mini-fridges. Retreat rooms offer a single bed and a desk. During Panchakarma we equip each guest room with tea and fresh fruit. Transportation from airport to spa? If you are driving we have directions you can follow once you get into Boone. You will not need a vehicle during your stay. If you are flying we have several transportation services we would be happy to connect you with for your trip from the airport. It is about a two hour drive from the Charlotte airport. Call (828) 264-8382 to learn more. Or contact us for a free consultation to determine if Vibrant Life Panchakarma is right for you.